This work package develops a novel BE model for a multi-layered ground with one and two cylindrical cavities in the horizontal direction to allow for coupling of a single and twin tunnels respectively and multiple cavities in the vertical direction to allow for coupling of piles. The model is used to understand the effect of weak coupling between tunnels and between tunnels and piled-foundations, and to identify the range of its validity. A periodic BE model for a multi-layered ground with horizontal and vertical cavities. 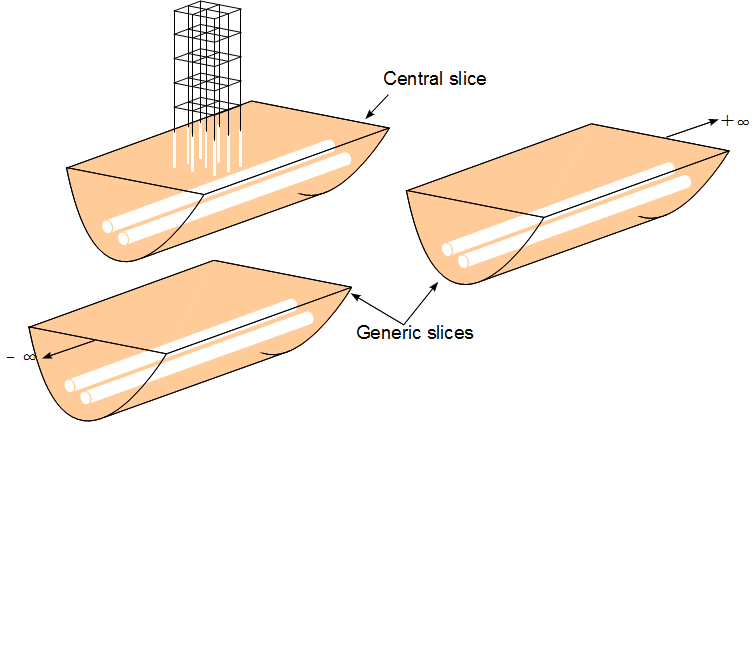 Developing a BE model, with the aid of the periodic structure theory to decrease the computational cost, of a generic slice with one or two cylindrical horizontal cavities and a central slice containing horizontal and vertical cavities. The Green’s functions for a multi-layered ground are computed using the ElastoDynamics Toolbox (EDT) of KU Leuven. Modelling the piles by adopting bar formulation for axial deformation and beam formulation for bending, and simulating the tunnels using the thick shell theory in cylindrical coordinates. Coupling the tunnels and piles to the horizontal and vertical cavities after joining the slices developed in task 1 together. The coupling is carried out using the transfer functions of the two systems. Investigating the effect of tunnel, soil and pile properties, weak coupling and the effect of pile sleeving on ground-borne vibration from tunnels. Developing a FE model for a building and investigating the effect of its parameters on the vibration transmission. Investigating the effect of weak coupling by comparing the results of the model, when accounting or discounting the building, against measurements of Aecon and Arup for impulse excitation.